Interstate 70 (I-70) is a major east–west Interstate Highway in the United States that runs from I-15 near Cove Fort, Utah, to I-695 near Baltimore, Maryland. I-70 approximately traces the path of U.S. Route 40 (US 40, the old National Road) east of the Rocky Mountains. West of the Rockies, the route of I-70 was derived from multiple sources. The Interstate runs through or near many major cities, including Denver, Kansas City, St. Louis, Indianapolis, Columbus, Pittsburgh, and Baltimore. The sections of the interstate in Missouri and Kansas have laid claim to be the first interstate in the United States. The Federal Highway Administration has claimed the section of I-70 through Glenwood Canyon, completed in 1992, was the last piece of the Interstate Highway system, as originally planned, to open to traffic. The construction of I-70 in Colorado and Utah is considered an engineering marvel, as the route passes through the Eisenhower Tunnel, Glenwood Canyon, and the San Rafael Swell. The Eisenhower Tunnel is the highest point along the Interstate Highway system, with an elevation of 11,158 ft (3,401 m). Interstate 70 begins at an interchange with Interstate 15 near Cove Fort. Heading east, I-70 crosses between the Tushar and Pahvant ranges via Clear Creek Canyon and descends into the Sevier Valley, where I-70 serves Richfield, the only town of more than a few hundred people along I-70's path in Utah. Upon leaving the valley near Salina, I-70 crosses the 7,923 ft (2,415 m) Salina Summit and then crosses a massive geologic formation called the San Rafael Swell. Prior to the construction of I-70, the swell was inaccessible via paved roads and relatively undiscovered. Once this 108 mi (174 km) section was opened to traffic in 1970, it became the longest stretch of interstate highway with no services and the first highway in the U.S. built over a completely new route since the Alaska Highway. It also became the longest piece of interstate highway to be opened at one time. Although opened in 1970, this section was not formally complete until 1990, when a second steel arch bridge spanning Eagle Canyon was opened to traffic. Since I-70's construction, the swell has been noted for its desolate beauty. The swell has since been nominated for National Park or National Monument status on multiple occasions. If the swell is granted this status, it arguably would be the first time a National Park owes its existence to an interstate highway. Most of the exits in this span are rest areas, brake check areas, and runaway truck ramps with few traditional freeway exits. I-70 exits the swell near Green River. From Green River to the Colorado state line, I-70 follows the southern edge of the Book Cliffs. Entering from Utah, I-70 descends into the Grand Valley, where it meets the Colorado River, which provides its path up the western slope of the Rocky Mountains. Here I-70 serves the Grand Junction metro area before traversing more mountainous terrain. The last section of I-70 to be completed was the 15-mile (24 km) Glenwood Canyon. This stretch was completed in 1992 and was an engineering marvel, due to the extremely difficult terrain and narrow space in the canyon, which requires corners that are sharper than normal Interstate standards. Construction was delayed for many years due to environmental concerns. The difficulties in building the road in the canyon were compounded by the fact the Denver & Rio Grande Western railroad occupied the south bank, and many temporary construction projects took place to keep US 6 open, at the time the only east–west road in the area. Much of the highway is elevated above the Colorado River. The speed limit in this section is 50 mph (80 km/h), due to the limited sight distance and sharp corners. I-70 at the portal of the Eisenhower–Johnson Memorial Tunnel. The traffic signal is controlled from a command center and used for incident management. 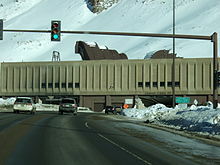 The Eisenhower–Johnson Memorial Tunnel, the highest vehicular tunnel in North America and the longest tunnel built under the Interstate program, passes through the Continental Divide. Because of the rugged and narrow terrain of the Rocky Mountains, I-70 is one of few roads connecting Colorado's ski resorts with Denver. Descending through the eastern foothills of the Rocky Mountains, one can see the Denver skyline on a clear day. This can fool truckers and other unsuspecting drivers, because one must still traverse 10 miles (16 km) of steep grade road before reaching the city. A series of signs warns truckers of the steep grade. As I-70 leaves the foothills, it goes through Denver and intersects Interstate 25, serving as the central east-west artery through the city. Leaving Denver, I-70 levels out and traverses the wide plains through eastern Colorado. East of Denver, I-70 makes a broad turn to the south-southeast for 30 miles (48 km) before reaching Limon and resuming its eastward journey toward Kansas. Coming from Colorado, I-70 enters the prairie, farmlands, and rolling hills of Kansas. This portion of I-70 was the first segment to start being paved and to be completed in the Interstate Highway System. It is given the nickname "Main Street of Kansas", as the interstate extends from the western border to the eastern border of the state, covering 424 miles (682 km) and passing through most of the state's principal cities in the process. In Salina, I-70 intersects with I-135, the longest "spur" route in the Interstate system, forming the latter's northern terminus. In Topeka, I-70 intersects I-470, twice. At the eastern intersection, the Kansas Turnpike merges, with I-70 becoming a toll road. This is one of only two sections of I-70 that are tolled. (The other is part of the Pennsylvania Turnpike.) I-70 carries this designation from Topeka to Kansas City, the eastern terminus of the turnpike. About halfway between Topeka and Kansas City, Kansas, I-70 passes through Lawrence (home to the University of Kansas). The tolled portion of the turnpike ends near Bonner Springs, just west of Kansas City. There is also a third child route in Topeka, I-335, which runs from I-470 south to meet up with I-35 in the Flint Hills town of Emporia. Just past the Bonner Springs Toll Plaza I-70 crosses I-435 for the first time, which allows travelers to bypass the downtown traffic via I-435, which encircles the Kansas City metropolitan area. Further down the highway in Kansas City, Kansas, approximately 3 miles (4.8 km) before the 18th Street Expressway, I-70 is intersected again by another child route. This route, I-635, runs from I-35 at its southern terminus up to I-29, just about 5 miles (8.0 km) across the Missouri River, at its northern terminus. From I-635 to just past the 7th Street (US 169) exit, I-70 runs adjacent Union Pacific's Armourdale Yard. Here I-670 (also designated "Alternate 70" on some signs) diverges, providing a more direct route that rejoins I-70 proper a few miles east in Missouri. The highway passes over the former stockyards and rail yard when it crosses the Kansas River on the Lewis & Clark Viaduct into downtown Kansas City, Missouri. After crossing the Lewis & Clark Viaduct, I-70 enters Missouri. It encounters a loop of freeways, called the Alphabet Loop, which contains I-70 as well as I-35, I-670, US 24, US 40, US 71, and US 169. In the southern part of this loop, I-670 cuts directly through the downtown while I-70 bypasses the taller buildings a few blocks north near the Missouri River. Westbound I-670 is also designated Alternate I-70. Most of the interstates in this loop are in their second mile, so all exits (no matter which interstate carries the road) are numbered 2 and suffixed with every letter of the alphabet except for I, O, and Z. The section of I-70 in Downtown Kansas City is approximately the southern city limits of "City of Kansas" when it was incorporated in 1853. The first two auto bridges in Missouri mark the city's original boundaries with the Buck O'Neil Bridge (US 169) being the west boundary while the Heart of America Bridge (Route 9) is the east boundary. Another intersection of note is the second traverse of I-435. This is primarily notable because it immediately precedes the Truman Sports Complex (home of both Arrowhead Stadium and Kauffman Stadium) and also because the entrance ramps from I-435 northbound onto I-70 eastbound also serve as the exit ramps from I-70 into the Truman Sports Complex parking lots. This section of the Interstate is marked as the "George Brett Super Highway", named after the Kansas City Royals third baseman who played the entirety of his career (1973–1993) at the K. The last interstate intersection in the immediate Kansas City metro area is with I-470 in Independence. After passing Kansas City, I-70 traverses the length of Missouri, west to east. It passes through the largest city between Kansas City and St. Louis, Columbia, which is about halfway between the two major cities, and the home of the University of Missouri. The terrain is rolling with some hills and bluffs near rivers. I-70 also crosses the Missouri River twice (as did the original US 40)--at Rocheport, about 15 miles (24 km) west of Columbia, and at St. Charles, about 20 miles (32 km) northwest of St. Louis. Most of the highway on this stretch is four-lane. Various proposals have been made to widen it (at an estimated cost of $3.5 billion) including turning it into a toll road. I-70 eventually gets into the St. Louis metro area and US 40 splits to the south, along with US 61, which does not have a concurrency with I-70. In late 2009, the intersecting road was upgraded to Interstate standards along with the completion of the overhaul of I-64. After this interchange, I-70 intersects two child routes, I-270 and I-170. After passing several bedroom communities in north St. Louis County, I-70 enters the city limits of St. Louis. It turns east to cross the Mississippi River on the Stan Musial Veterans Memorial Bridge, connecting with an extension of I-44, which takes the former I-70 route through Downtown St. Louis to meet I-55 at its connection to the Poplar Street Bridge. The 1985 World Series between the Kansas City Royals and St. Louis Cardinals was nicknamed the "I-70 Series" because St. Louis and Kansas City are the two endpoints of I-70 in Missouri and the highway passed both the Cardinals' Busch Stadium and the Royals' Kauffman Stadium. After crossing the Stan Musial Veterans Memorial Bridge, I-70 merges with I-55, while I-64 splits off I-55 and I-55 and I-70 become concurrent. When the routes intersect I-270, I-55 stays on its own pavement using the mileposts from the Poplar Street Bridge, while I-70 heads east on I-270's pavement using I-270's mileposts. So when I-55/70 intersects I-270 from the southeast, the exit numbers would be 20 A/B, whereas if I-70 intersects I-55/270 from the east, it would be exits 15 A–B. I-70 was rerouted from the Poplar Street Bridge to the Stan Musial Veterans Memorial Bridge north of downtown St. Louis, which opened in February 2014. I-70 passes through numerous county seats in Illinois, among them Vandalia, the state capital from 1818 to 1839. It runs concurrently with I-57 around Effingham, then proceeds east towards Indiana. I-70 enters Indiana just to the west of Terre Haute and then crosses the Wabash River before skirting the city's south side. After passing through miles of gently rolling terrain in rural west-central Indiana, the freeway approaches the major metropolitan area of Indianapolis. The main entrance to Indianapolis International Airport was relocated to I-70's exit 68 on November 11, 2008. Upon nearing the central business district of Indiana's capital city, the visages of Lucas Oil Stadium and the newly constructed (in 2011) JW Marriott Indianapolis hotel, with the city's skyline as their backdrop, now dominate the view to the north from the freeway. After passing just to the south of the world headquarters for Eli Lilly & Co., I-70 and Interstate 65 have a brief multiplex through the eastern side of downtown Indianapolis. The junction points of these two major routes are known locally as the south split and north split respectively. It is also noteworthy the other two-digit Interstates serving Indianapolis do not reach the city's core. As a result, I-70 motorists must use the I-465 beltway in order to reach I-69 without leaving the Interstate System, while those similarly bound for I-74 access that route via its concurrency around the southern portion of the I-465 loop. After passing through much of the near northeast side of Indianapolis, I-70 again encounters the I-465 beltway (which carries a multitude of unsigned U.S. and Indiana state highways). I-70 continues on nearly due east from this point, first traveling through suburban Indianapolis, then transitioning into rural east central Indiana, where it passes just to the south of New Castle. Upon reaching the Richmond area, US 35 joins I-70 just before both routes leave the Hoosier State together and enter Ohio. Interstate 70 enters Ohio just east of the interchange with US 40 at Richmond, Indiana. Immediately to the east of this border, travelers notice a unique teal-blue arch that spans the width of the freeway, with a "Welcome to Ohio" greeting sign above the eastbound lanes. A sign thanking travelers for visiting Ohio is mounted on the other side of the arch for westbound travelers. Continuing eastbound, I-70 intersects I-75 north of Dayton, followed by I-675 on the east side of Dayton. Springfield is the next city, site of Buck Creek State Park. I-70 then encounters Columbus. Columbus is bounded by I-270, and is roughly centered on the intersection of I-70 and I-71, which share the same asphalt through a notoriously congested 1.5-mile (2.4 km) stretch locally known as the "South Innerbelt" or, more commonly, "The Split." This stretch has I-71 concurrent with I-70, where I-71 enters and exits from opposite sides of I-70, causing traffic getting on I-70 from I-71 northbound to have to cross four lanes of I-70 traffic to continue on I-71. A similar issue is present for southbound I-71 traffic as well. The Split will be reconstructed within the next few years. I-670 connects John Glenn Columbus International Airport (formerly Port Columbus International Airport) with I-270, I-71, and I-70. East of Columbus, I-70 passes through Zanesville and on to Cambridge, where it intersects I-77. Continuing on towards West Virginia, I-70 intersects I-470 just east of St. Clairsville. I-470 is primarily used for through traffic, and to avoid The Festival of Lights traffic during the Christmas season. In March 1995, a hole (from a former coal mine) opened up on the eastbound side of I-70 in Guernsey County near Old Washington and caused traffic to be rerouted onto US 40 between Old Washington and Cambridge for several months. The portion of I-70 in West Virginia crosses the Ohio River at Wheeling and runs through the Wheeling Tunnel. I-70 has only one through lane in each direction at the tunnel. A major interchange was planned but never completed on the east side of the Wheeling Tunnel. Upon merging with I-470, I-70 goes uphill towards Dallas Pike, West Virginia, This part of the road is called "Two Mile Hill", which is known locally for the many accidents at the bottom of the hill. I-70 has brought major development in Ohio County, the only county the route passes through in West Virginia, in the past few years. On the north side of the highway a former strip mine is being developed into a retail area called the Highlands. This stretch of I-70 is the shortest that I-70 is in any state, traveling only 15 miles (24 km) from the Ohio River to the Pennsylvania border. I-70 was initially envisioned to go through downtown Pittsburgh but now goes south of it. Its originally planned route was later incorporated into I-376, as well as parts of I-76 and I-79. I-70 also overlaps I-79 near the Pittsburgh suburb of Washington for three miles (4.8 km). The 38 miles (61 km) of I-70 between Washington and New Stanton is a sub-standard section of the highway. This section of I-70 used to be PA 71. It is characterized by sharp curves, limited sight distance, narrow shoulders, and lack of merge lanes at interchanges. Traffic on clover leaf ramps must weave in the right through lane of traffic due to the lack of a third lane for entering and exiting traffic. Other on and off ramps effectively function as right-in/right-out interchanges, forcing vehicles to weave in and out of the exit lane. The speed limit on this stretch is 55 miles per hour (89 km/h). From New Stanton to Breezewood, I-70 overlaps I-76 and the Pennsylvania Turnpike. This is one of only two tolled sections of I-70 (the other is in Kansas, where the portion of the Kansas Turnpike east of Topeka is signed I-70). Drivers on I-70 near Breezewood have to leave the freeway and travel a few blocks on US 30 past several traffic lights before returning to the freeway. This stretch of I-70 is one of the few gaps on the Interstate Highway System. I-70 continues on almost due south to the Maryland border after leaving I-76 (Pennsylvania Turnpike) at Breezewood. This section is posted at 55 miles per hour (89 km/h) and is heavily patrolled. After the border, it meets I-68's eastern end and turns east towards Baltimore and Washington, D.C. In Maryland, I-70 runs from the Pennsylvania state line near Hancock east across the central portion of the state towards Baltimore, following the route of the National Road, now known as US 40. It is the major east–west highway in the state, serving the cities of Hagerstown and Frederick and bypassing Ellicott City. East of Frederick, the route was originally designated Interstate 70N. The highway serves Washington, D.C., via I-270, which was once designated Interstate 70S. Uniquely, I-70 indirectly serves a branch of the Washington Metro at Shady Grove via I-370, which only connects to I-270. I-70 was planned to end at I-95 in Baltimore, but due to local opposition, it was only built to Maryland Route 122 (MD 122). As first proposed, the western terminus of I-70 was Denver, Colorado. However, Utah and Colorado pressured the federal government to extend the plans for I-70 farther west, arguing a direct link between Denver and Salt Lake City, Utah, was vital for an effective highway system. The proposal was to follow what is now US 6 west and connect to I-15 at Spanish Fork, Utah. Federal planners (influenced by the military) agreed to extend the proposed route of I-70, but not to serve Salt Lake. The military wanted to better connect Southern California with the Northeastern U.S. This led to I-70's constructed route through the San Rafael Swell terminating at Cove Fort. Many motorists include I-70 as part of their cross-country drives between New York City and Los Angeles (which are accessible to I-70 via other Interstates). As a result of freeway revolts in the Baltimore area, I-70 was not completed east of MD 122 to its planned terminus on I-95 within the city of Baltimore, and it now ends at a four-way symmetrical stack interchange with I-695, the Baltimore Beltway. Until November 2014, I-70 ended at a Park and Ride lot at MD 122 as the freeway enters the city of Baltimore at exit 94. Commuters park on the pavement where high-speed freeway lanes were to be. The former freeway from I-695 to MD 122 is being converted into a two-lane parkway to be renamed Cooks Boulevard, maintained by the Maryland State Highway Administration. The highway gave its name to the I-70 Killer, a serial killer who committed a string of murders within a few miles of it in several Midwestern states in the early 1990s. No suspect has ever been apprehended despite the widespread publicity the murders generated, including their being featured several times on the television show America's Most Wanted and Unsolved Mysteries. John Allen Muhammad and Lee Boyd Malvo, the duo responsible for the Beltway sniper attacks, were apprehended at a rest stop on I-70 near Myersville, Maryland, in 2002. The 1985 World Series was a contest between the St. Louis Cardinals and the Kansas City Royals, and won by the Royals. As these cities are primarily connected by Interstate 70, the media often called series the I-70 Series. US 89 north-northeast of Sevier. The highways travel concurrently to Salina. US 50 / US 89 in Salina. I-70/US 50 travels concurrently to south-southwest of Mack, Colorado. US 6 / US 191 west of Green River. I-70/US 6 travels concurrently to south-southwest of Mack, Colorado. I-70/US 191 travels concurrently to west-southwest of Thompson Springs. US 6 northeast of Palisade. The highways travel concurrently to Rifle. US 6 in Chacra. The highways travel concurrently to Gypsum. US 6 / US 24 northwest of Minturn. I-70/US 6 travels concurrently to Silverthorne. US 6 north-northeast of Keystone. The highways travel concurrently to east of Idaho Springs. US 40 east of Empire. The highways travel concurrently to east of Idaho Springs. US 40 north of Evergreen. The highways travel concurrently to north-northwest of Genesee. I‑25 / US 6 / US 85 / US 87 in Denver. I-70/US 6/US 85 travels concurrently through Denver. I‑270 / US 36 in Denver. I-70/US 36 travels concurrently to Byers. US 40 / US 287 in Aurora. The highways travel concurrently to Limon. US 24 / US 40 / US 287 east of Limon. I-70/US 24 travels concurrently to Seibert. US 24 in Burlington. The highways travel concurrently to south-southwest of Levant, Kansas. US 40 in Oakley. The highways travel concurrently to Topeka. I‑470 / US 75 in Topeka. I-70/US 75 travels concurrently through Topeka. US 24 / US 40 / US 73 in Bonner Springs. I-70/US 24/US 40 travels concurrently to Kansas City, Missouri. US 69 in Kansas City. US 69 / US 169 in Kansas City. I-70/US 169 travels concurrently to Kansas City, Missouri. I‑35 in Kansas City. The highways travel concurrently through Kansas City. I‑29 / I‑35 / US 24 / US 71 in Kansas City. I-70/US 71 travels concurrently through Kansas City. US 40 in Grain Valley. The highways travel concurrently to Boonville. US 40 west of Columbia. The highways travel concurrently to Wentzville. I‑55 / I‑64 / US 40 in East St. Louis. I-55/I-70 travels concurrently to northwest of Troy. I-70/US 40 travels concurrently to Troy. US 40 northeast of Highland. The highways travel concurrently to north of Pocahontas. I‑57 southwest of Effingham. The highways travel concurrently to Effingham. US 40 east-northeast of Marshall. The highways travel concurrently to Terre Haute, Indiana. I‑65 in Indianapolis. The highways travel concurrently through Indianapolis. US 35 in Richmond. The highways travel concurrently to north-northwest of Campbellstown, Ohio. I‑71 in Columbus. The highways travel concurrently through Columbus. US 40 south of Old Washington. The highways travel concurrently to west-southwest of Morristown. US 40 / US 250 on Wheeling Island. The highways travel concurrently to Wheeling. I‑79 north of Washington. The highways travel concurrently to east-southeast of Washington. I‑76 in New Stanton. The highways travel concurrently to southwest of Breezewood. US 30 in Breezewood. The highways travel concurrently through Breezewood. US 522 north of Warfordsburg. The highways travel concurrently to Hancock, Maryland. I‑68 / US 40 north-northwest of Hancock. I-70/US 40 travels concurrently to south-southwest of Pecktonville. I‑270 / US 40 in Frederick. I-70/US 40 travels concurrently to West Friendship. I-70 has one of the closest distances between two distinct child interstates with the same child interstate number. I-470 near Topeka, Kansas, and I-470 on the east side of Kansas City, Missouri, are approximately 72 miles (116 km) apart. This record is surpassed by I-291 around Hartford, Connecticut, and I-291 near Springfield, Massachusetts, which are unrelated, but are 23 miles (37 km) apart. I-270 is a short connector between I-70 and I-25 in Denver, Colorado. It also carries U.S. 36 along its entire length. I-470 is a loop around the south side of Topeka, Kansas. I-670 is an alternate route of I-70 in Kansas City, Kansas, and Kansas City, Missouri. I-470 is a connector between I-70 and I-435 in southeastern Kansas City and Independence, Missouri. I-170 is a connector between I-64 and I-270 in St. Louis County, Missouri. I-270 loops around St. Louis city and county. It is supplemented by I-255 to the east. I-270 is a beltway around Columbus, Ohio. I-670 is a 9.37 mile highway beginning at I-70 west of Downtown Columbus and terminating at I-270 in eastern Columbus that also provides direct access to John Glenn Columbus International Airport from downtown. I-470 is a southern bypass around Wheeling, West Virginia. I-270 is a spur to Washington, D.C.. It was formerly designated I-70S. I-370 is a spur to Gaithersburg and Rockville, Maryland, from I-270. It never connects to I-70. 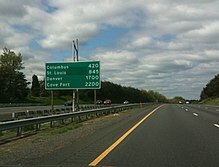 I-170 was to have been a spur into downtown Baltimore, Maryland, but the short part that opened never connected to I-70 or to any other Interstate Highway. It was decommissioned in 1989, and US 40 is the current designation for the freeway. ^ a b Adderly, Kevin (January 15, 2014). "Table 1: Main Routes of the Dwight D. Eisenhower National System of Interstate and Defense Highways as of December 31, 2014". Route Log and Finder List. Federal Highway Administration. Retrieved February 6, 2015. ^ "Eisenhower Interstate System". Eisenhower Presidential Library and Museum. Archived from the original on January 27, 2007. Retrieved January 30, 2007. ^ Stufflebeam Row, Karen; LaDow, Eva & Moler, Steve (March 2004). "Glenwood Canyon 12 Years Later". Public Roads. Federal Highway Administration. 67 (5). Retrieved August 9, 2009. ^ Richard F. Weingroff. "Dwight D. Eisenhower System of Interstate and Defense Highways Engineering Marvels". Federal Highway Administration. Retrieved November 8, 2018. ^ a b "Why Does I-70 End in Cove Fort, Utah?". Ask the Rambler. Federal Highway Administration. Retrieved January 30, 2007. ^ The 2014 Road Atlas (Map). Rand McNally. 2014. p. 58. ^ "Missouri official calls for rebuilding I-70". Kansas City Business Journal. February 8, 2006. Retrieved January 30, 2007. ^ "Route 40/61 Corridor Projects". Missouri Department of Transportation. Archived from the original on March 11, 2007. Retrieved January 30, 2007. ^ Roig-Franzia, Manuel (November 22, 2001). "The Town That Stops Traffic: Travelers Encounter Way Station as Way of Life in Breezewood". Washington Post. p. B1. ^ Weingroff, Richard F. (Summer 1996). "Three States Claim First Interstate Highway". Public Roads. Federal Highway Administration. 60 (1). Retrieved August 26, 2017. ^ Gayle, William (April 9, 2014). "An Application from the State Highway or Transportation Department of Maryland for the Elimination of an Interstate Route" (PDF) (Letter). Letter to American Association of State Highway and Transportation Officials. Annapolis: Maryland State Highway Administration. Retrieved August 26, 2017. Wikimedia Commons has media related to Interstate 70.